A bicycle is a great way to get around Nova Scotia. Because of the relatively low population, all but the main highways tend to be quiet and fine for cycling. 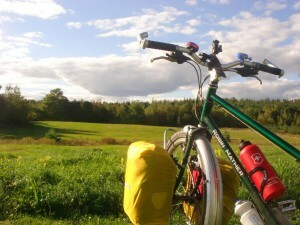 You can do it yourself or join an organized bicycle tours if you don’t want to go independently. The Cabot Trail around Cape Breton island is one of the most popular cycling destinations. It has amazing scenery and history to discover, including wonderful mountain bike trails in the Cape Breton Highlands National Park. Also check out the Fortress Louisbourg and the resort town of Baddeck. Pedal through largely flat farmland and orchards in the Annapolis Valley, learn about Acadian heritage at Grand-Pré, colonial history at Fort Anne and stop for a few days around the university town of Wolfville so you can hike to Cape Split. Admire wildlife from your bike as you ride down Digby Neck to Brier Island. See rugged coastlines, visiting the charming fishing villages of Lunenburg and Mahone Bay and discovering Nova Scotia’s maritime heritage at the Fisheries Museum of the Atlantic before heading into the capital Halifax via Peggys Cove. Experience the world’s highest tides by cycling between the adventure activity of tidal-bore rafting and the more laidback rockhounding in the Central Nova Scotian villages of Parrsboro, Joggins and Five Islands. Ride to Nova Scotia’s warmest beaches and eat blueberries on the rural Northumberland shore, stopping at places like Pugwash and Tatamagouche. There are plenty of nice back roads in this area. Consider the weather. You’ll have the best conditions between June and September. Spring cycling can be marked by chilly mornings and evenings, rain and even snow as late as May. Summer temperatures fade sharply by mid-September, although autumn cycling does offer fantastic views as the trees change colour. Traffic is fairly laid back and courteous compared to many places in the world but you’ll still need to follow the rules of the road. That means pulling over if you’re holding up traffic. You’ll need a bell or horn and you must wear a helmet. If you’re cycling at night or in poor weather, you should have lights and reflectors. Wild camping isn’t legally allowed in Nova Scotia, although if you’re discreet enough, don’t trespass and use low-impact camping techniques, you’re unlikely to be bothered. Happily, there are also many provincial and national parks as well as a wealth of private campsites so you shouldn’t need to free camp very often. You can find more information on cycling in Nova Scotia on Bicycle Nova Scotia – a website that lists various clubs and activities in the province.